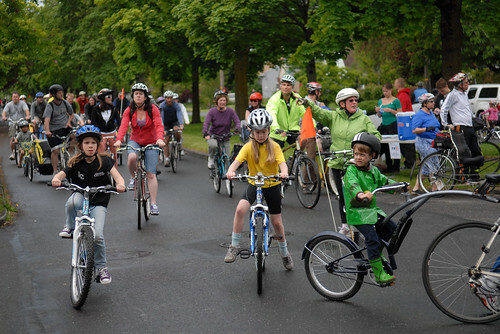 With the help of hundreds of volunteers and a gazillion kids, parents, and happy adults, the Portland Bureau of Transportation kicked off the 2010 Sunday Parkways season in Northeast Portland yesterday. This was Portland's fifth Sunday Parkways since the inaugural June 2008 event, and the first of five scheduled for 2010. I must admit to sleeping in late and not getting on the course until early afternoon. My only regret of the day was not getting out earlier. It was just pure bliss. I couldn't stop smiling. The bedrock of Sunday Parkways is the hundreds of volunteers that we need for each event. If you're looking for an extremely satisfying way to give back, please consider being a Sunday Parkways volunteer this summer.